Halloween is upon us, and while some are rocking ultra-cool but gruesome looks, others are choosing to go more glam. This Reddit user's Sephora bag Halloween costume basically won Halloween for beauty junkies, no contest. Not only does it celebrate one of beauty's biggest retailers, but it's the perfect homage to a cosmetic lover's one true love — makeup. 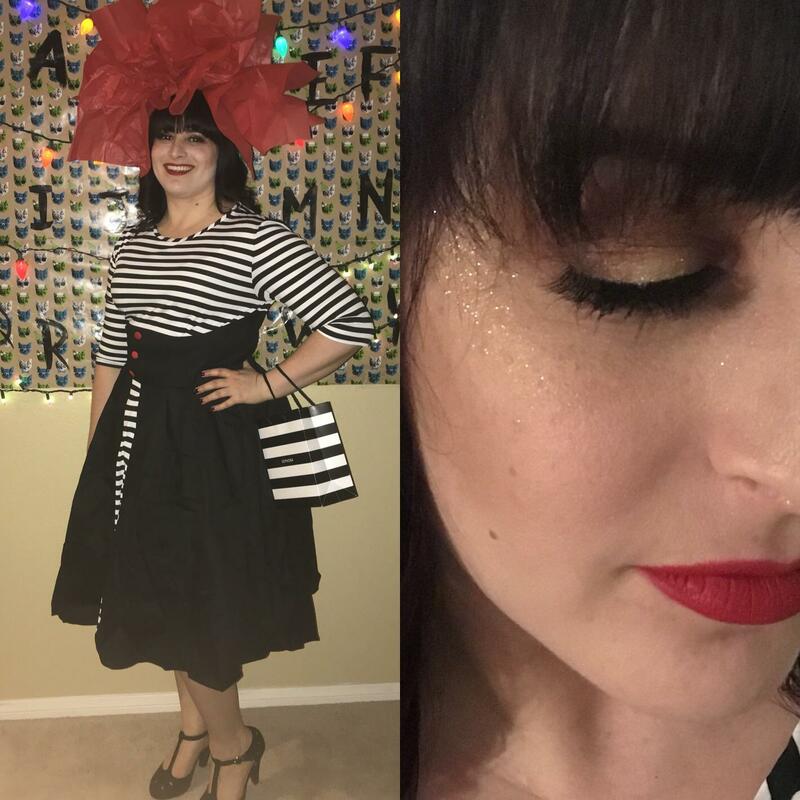 Reddit user Lauraizm — who's real name is Laura — took to the website to showcase her Sephora-inspired costume, which you will definitely relate to if you love the makeup retailer. In the image, Laura is wearing an adorable dress that, according to her post, isn't a costume at all. Instead, it's a dress that she got from Amazon and added a crinoline underneath to add extra volume. Of course, though, the most memorable part of Laura's Sephora costume is her headpiece. The crown of red tissue paper surrounding her head is spot-on for Sephora's classic color scheme. With a real life Sephora bag in her hand, it was super obvious what Laura was dressing up as for All Hallow's Eve. Plus, it was also obvious that she may have just won Halloween like champ. Like the good beauty junkie she clearly is, Laura also broke down all of the products on her face. If that golden glow on her face looks familiar, it's because it's none other than the Fenty Beauty Trophy Wife highlighter. After all, with Fenty Beauty being such a huge hit exclusive to Sephora, wearing it as part of your costume is basically a must, right? As for her lips, Laura is rocking ColourPop's Creeper Ultra Matte Lip. In a fun twist, the brand launched at Sephora on Halloween, Oct. 31. Of course, Laura isn't the only one who has dressed up as a Sephora bag. The brand liked a post from Twitter user Dianne J Miller who did a different iteration of the costume with her husband. With a more modern dress and probably the world's greatest headpiece, she totally slayed this Halloween look. And who doesn't love her "Sephora Widower" husband? For Laura, however, the inspiration seems to have come from a BuzzFeed video about the best do-it-yourself costumes for beauty lovers. Laura's Halloween look definitely veers more toward the vintage side, but it also shows just how personal you can make your look. Whether you want something with a '50s flare or something more modern, you can totally rock it. Of course, beauty lovers have served up more beauty-themed costumes this Halloween season. Let's just say people got creative for the spooky night, and their makeup drawers were a source of serious inspo. Fenty Beauty was a serious winner when it came to beauty-related costumes this year, and they were perfect. This Killawatt DYI is so fun. But other beauty lovers have been going as their Fenty shade for their costume. And who could forget Kristen Fiori, the makeup artist who transformed herself into Jaclyn Hill earlier in the month? Whether or not she actually did go as the YouTuber for Halloween, the costume idea was still utter genius. Plus, any fan would have to do a double take to tell them a part. Now that's the sign of a successful costume. Even though it's probably too late to switch out your costume for a new Sephora-inspired look this year, don't fret. The best part about a Sephora bag is that it never goes out of style. While the spooky season may be coming to an end, at least you've got your inspo for next year. You'll just have to shop for more makeup to have bags for ... reference. Yes, reference materials are essential.